Here he is, painted and ready for battle. This guy, while just a single model, was a huge challenge for me... both modeling and painting. The model is loaded with tons of detail and can quickly become overwhelming if you don't have a plan. The simple, non-standard color scheme (a great choice by my client) helps prevent that I think. I was hesitant at first, thinking the all red armour was the way to go but like I mentioned before, the more I painted, the better the model looked. 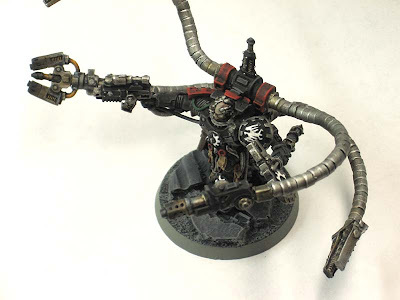 The real challenge was painting the mechanical arms. With this guy being one of the Senior Techmarines in a force, I wanted something that conveyed that. The painting had to bring all the conversion work together. I went for a weathered and highly used look to the arms. I made sure to add "grime and oil" to the areas I thought it would collect it. Not so much that he looked to be in a state of disrepair but enough that you know this guy means business and he doesn't sit around all day polishing gun barrels. With the arms being such a big part to the model, I wanted to give them as much attention as possible. It was a bunch of little touches to the metal like going all out with the heat effects on the plasma tips. From black through brown and into a blue tint. Other things like small areas of rust, dirt and scratches also helped bring them to life and make the model look like a complete piece instead of a Techmarine model with some different, out of place arms "added on." Stunning, will be one happy client I bet! Another fantastic model. From conversion to paint work this model is fantastic. I like the different colour scheme and the way it all fits together. 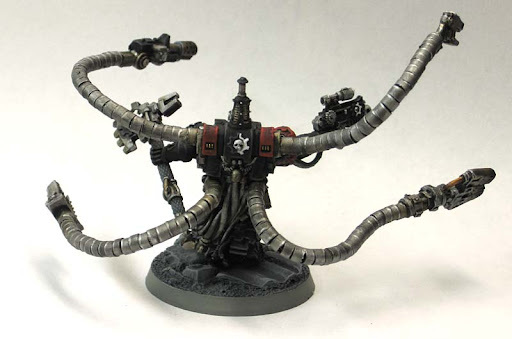 I can see the fine highlights on the arms you mentioned, this really enhances the whole effect and brings the cool! One of the parts that really stands out are that really well done dark red sections around the backpack and shoulder trim. Beautifully done with the slightly darker tones, ties in with the rest of the figure nicely. 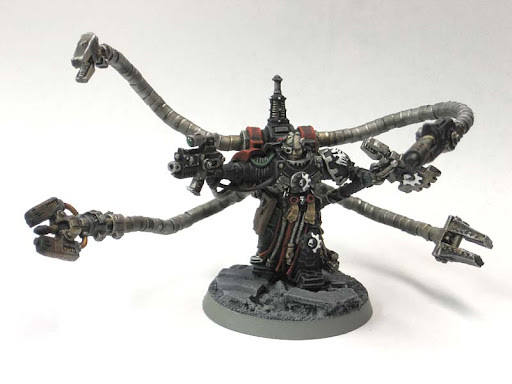 I would be interested in how it was done as I have a mate who wanted to do something similar for the carapace on his nids. Although at a guess I would have to say Red Gore glazed over Black as a base and worked up to Blood Red highlights. Y/N? At any rate kudos on a great job Ron! Interestingly one of my clients recently requested a Techmarine in colours matching the rest of their army (Novamarines) but despite my initial reservations it seemed to come together well. I wonder if it will be a growing trend. 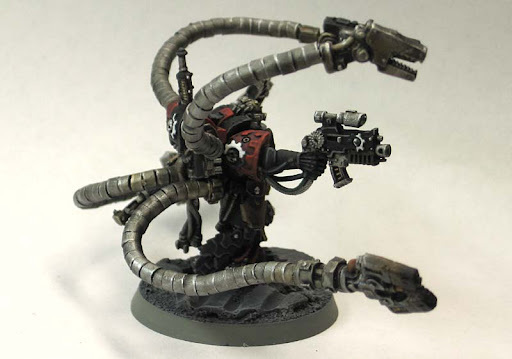 I just hope no-one wants the crazy cammo schemes from RT era marines. That is just freekin' cool. Well done Ron, well done indeed. I was a bit skeptical when you started but the end product sure looks great! Ron this looks awesome. You are right, the paint job really pulls the attention to the arms. Well done! Unsurprisingly, it's more awesome work from the Ron. Seriously, though, it's some sweet work. The non-standard paint job makes him stand out as the commander-type, and he is superbly weathered and done. I would field that, just based on how cool it looks. 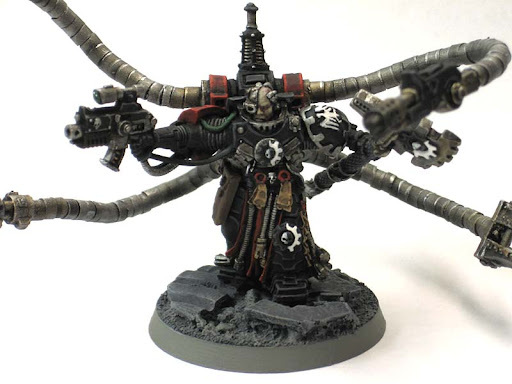 Now my Guard need a Tech-Priest, and Wolves need and Iron Priest. The final product really fits my mental picture of the AM. This is really Doc Octo!!! I wonder what you would use... maybe give him a jetpack? fred: Thanks, glad you like him!